DeLaneau isnʼt just a Swiss fine watch brand, it is rather a universe of fine arts. One where the métiers dʼarts, architecture, design, music, poetry, nature and passion meet. In effect, a DeLaneau timepiece is only the matter of these high arts. Atame is the latest addition to DeLaneauʼs universe. 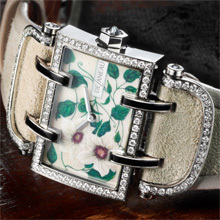 Known for the refinement of its mecanical timepieces dedicated to women only, as well as the artistry of its enamel decors, models such as Amazone or Dôme have contributed to the impeccable reputation of DeLaneau. Today, Atame reveals features such as a smaller case yet respects - in all points - the DeLaneau codes: pure and simple lines of the watch case, clear inspiration of the streamlined aesthetic of the Art Deco period, strong ties with the world of arts. With Atame, the sapphire glass is curved and two original links bind the glass, case and strap together. Indeed, nested in a rectangular case, one of the particularity of Atame is the original links between the case and suede leather strap. Instead of the usual logs at the four corner of the case, Atame adopts four links - two on the top and two on the bottom - in the center of the watch case. These links actually start on the sapphire cristal glass to end on the strap. It inhences the rectangular shape of the case as well as emphasizes the idea of ties that Atame holds dear. Furthermore, the bejewelled arches that evolve on the top of both straps also re enforce the concept of links, Atame meaning «tie me» in spanish. Atame is not just a watch, it is an object that captures the essence and ties of life. Modern women experience different lives, inhabit many worlds as - if every few years - they shed their old self and are born anew. Atame is the token of her inner world. It is the figurative element that materializes the turns and twists of her life. It is the link with her feelings. It wraps around her wrist as a soft satin ribbon delicate yet strongly emotional. Atame can be dressed in many ways. 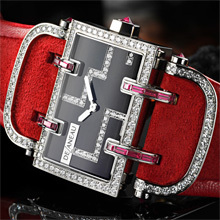 Clad in red and black, as illustrated here, it bares a black onyx dial as well as a case set with diamonds and baguette rubbies topped by a vivid red suede strap. It can adorn subtle tones as with the Clémathyte also illustrated here. The dial is a delicate floral miniature painting that took several painstaking hours to achieve - over 40 hours to manufacture such a piece - thanks to the incomparable talent of DeLaneauʼs enameller. Atame also adopt a vast color palette as well as mother of pearl dial or even a full diamond pavé face.